Only two months after the fall of the Berlin Wall, in January 1990, almost two hundred controversial East German visual and performance artists—including Jürgen Böttcher, the Autoperforation Artists, AG Geige, Via Lewandowsky, Trak Wendisch, Conny Hege, Klaus Killisch, Helga Paris and Hanns Schimansky—presented works rarely shown in the GDR at the exhibition space in the former La Villette slaughterhouses on the outskirts of Paris. 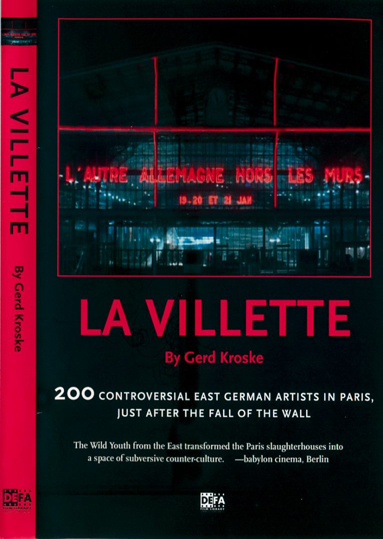 The unique, three-day exhibition, L’autre Allemagne hors les murs (The Other Germany Outside the Walls), was curated by East German art historian Christoph Tannert and French journalist Maurice Najman. In Kroske’s documentation, historical footage from Georges Franju’s 1949 film, Le Sang des bêtes (Blood of the Beasts), and texts from Les Chants de Maldoror (The Songs of Maldoror) by Comte de Lautréamont, blend to create a nuanced time capsule of an event that marked the end of an artistic era.